Introducing Gallery A – Fulfilling the Legacy of Aleen Aked and paving the way for collaboration, local artistic exposure and the growth of our vibrant arts community. Please join us for the Grand Opening at RMG Fridays on 9 January. Elizabeth Aleen Aked was an accomplished artist and a woman with a strong sense of the history and culture of the places she lived, especially her summer home and studio in Tyrone, Ontario. Miss Aked died in 2003; in her estate, a generous portion of her legacy was gifted to The Robert McLaughlin Gallery. With the support of the Aked Endowment and funding from the Department of Canadian Heritage, the RMG is thrilled to embark on an exciting new initiative aimed at fostering a thriving local arts community. During the summer of 2014, the RMG was under major renovations to create a professional exhibition space reserved for exhibiting the work of local artists, community collaborations, and themed group exhibits. The new space, features a professional gallery, an artist studio and rooms designed for bringing together arts communities. Opportunities are available for community partnerships and special initiatives as well as artist residencies that prioritizes artists who wish to experiment with new ideas, collaborate, and work in new directions. Artists will have increased opportunities to give public talks, participate in professional development workshops, and give and receive critical feedback from peers. Programming of this space is separate from our curatorial planning and proposal selections are made with a jury of local artists and arts professionals. We invite you to visit the new space, take a workshop or apply for an opportunity at Gallery A. Register online – spaces are limited. Ron Shuebrook will lead a workshop about the use of memories as a catalyst for art, while also considering aesthetic forms and expressive processes. Participants will explore a variety of graphic media such as graphite, charcoal, or ink, based on their interests. All materials provided but students are welcome to bring their own tools and materials if they prefer. Zhe Gu, Visual Arts Officer at the Ontario Arts Council (OAC) will lead this workshop aimed at professional Visual artists and Fine Craft artists. The workshop will cover the types of grants available, the selection process and how to prepare an effective application. Please bring any applications in progress, your artist statement, or previous grant text. Over the course of three days, artists may document their artwork in an environment designed for effective, professional documentation. RMG staff will be on hand with the appropriate lighting, hanging and photographic equipment. Artists may bring their own camera, or alternately a 10GB USB memory stick to transfer images onto. Maximum of five artworks, no larger than 7ft x 7ft. Wall-mounted works only. As some of you may have heard, we’re undergoing renovations right now and one of the biggest changes is the creation of Gallery A. The space is named for one of our major funders, the Aked Endowment, which was created from funds donated by the late artist Elizabeth Aileen Aked, who lived in Tyrone, Ontario. Aileen and her parents frequently traveled between Tyrone, Bermuda, Florida and England and Aileen documented every moment of it. Throughout the spring, I worked with Christine our Special Projects Assistant, to go through Aileen’s archive which totaled over 10 banker boxes filled with a lifetime of slides, photographs and 16mm films. (Aileen’s gift also included her 1928 Kodak Kodascope, which was lovingly restored to full working order by Pickering Audio Visual). The films, which date as far back is the early 1920’s, are probably my favourite – these rich black and white silent films, depict her and her family on long rambling road trips in their classic antique Buick, pet parrot in tow. The films include scenic vistas of Gaspe, a road trip to Banff National Park, road-side picnics and sun-filled summer swims. During all of these trips, Aileen spent a lot of her time painting, and she was an accomplished painter. As an artist, her donation to The Robert McLaughlin Gallery was quite purposeful – she wanted the endowment to support local artists in their professional development and provide opportunities for them to advance their practice. In addition to being the Manager of Public Programs here at the RMG, I’m also an artist and when I came into this position almost 2 years ago, we started thinking about how best to achieve Aileen’s vision. I know that for myself, professional spaces to exhibit are not easy to come by and are often programmed far in advance. I’m always looking for opportunities (and space!) to experiment with new ideas and work with large materials and I want more opportunities to talk with other artists critically about my work. After surveying and speaking with local artists, the concept of Gallery A was born. We decided to keep the use of the space flexible, to allow artists options in how they wanted to use it. I am imagining most will want to use it for solo or group exhibitions, but there is room for creativity, and thinking outside of the box. We also set up the Art Lab artist residency program so artists can use the space for experimentation, collaborations, new directions and this will hopefully lead to some new exciting work. Gallery A artists will be invited to give public lectures and tours, and we’ll be hosting a slew of professional development workshops, including grant writing, documenting your work, peer-to-peer feedback sessions and hands-on studio retreats. The letter A is a starting point. It represents a new beginning, and a priority. It represents our commitment to supporting local artists, which are at the center of Durham Region’s arts community. It all starts with artists. Gallery A can be a starting place for emerging artists as a new generation emerges from Durham Collage’s Fine Arts program. It can be a place for established artists, to exhibit their work, collaborate with peers, and perhaps even take some risks. And it can be a meeting place for communities to work with artists to engage in the arts in ways they had never imagined before. The possibilities for the space are wide open – all you have to do is get started. It isn’t an overstatement to say that in 2013 the RMG has big plans to expand our programming to include lots of new free opportunities for families to engage with art. We love our community and we know that families work hard all week and want to hang out on the weekend and have quality family time. We’re hoping that in 2013 you’ll choose the RMG once a month as a place to learn, connect, and communicate with your family through the creative arts. 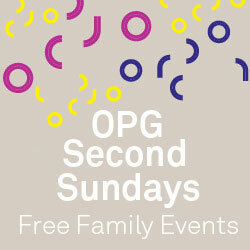 In 2012 we launched the incredibly successful OPG Second Sundays program. It’s a free art workshop series on the second Sunday of each month, sponsored by Ontario Power Generation. We had a great response and held many jam-packed art workshops. Due to popular demand, we’re expanding that program this year so that registration is no longer required, and all are welcome! All families should drop-in between 1 and 3pm on the Second Sunday of each month to work with gallery staff on guided art projects with themes celebrating the Lunar New Year as well as our many exhibitions. Check out the OPG Second Sundays Schedule here. We’re also introducing a new space in the gallery that is dedicated to families who want to visit the exhibitions with kids, and provide a chance for them to play, learn, and be inspired by art. Linger in the new Imagination Station! This space is currently being transformed into a family-friendly area with seating, books, toys, craft supplies, and cool interactive tools that will inspire, educate, and engage kids of all ages and abilities. The Imagination Station is launching in February, with an opening party on Family Day, Monday, 18 February. We are opening on Family Day for the first time in 2013 and are offering a free program to families. Come check out what we’re up to from 1-3pm. Enjoy light refreshments and a chance to try out the new Imagination Station (we’re calling it iStation for short!) The following weekend, we begin the regular iStation schedule, with the space being managed by trained educational volunteers who will help manage and guide craft projects, every Saturday and Sunday. You might think that was all we planned to offer in early 2013…but you’d be wrong! We’re also hosting a Festival of Colours celebration for families on Sunday 24 March. Phew! If you’ve ever considered enrolling kids in our PA Day Camps, March Break Camps or Summer Camps, these free family sessions will help familiarize you and your kids with staff and the facility, so that the transition to full day camps is easy and exciting. The RMG’s staff and volunteers are looking forward to meeting new families and connecting in new ways our community. If you have any questions about our free family programming, do not hesitate to connect with us. Email us at communications@rmg.on.ca or drop us a line on facebook at www.facebook.com/theRMG.